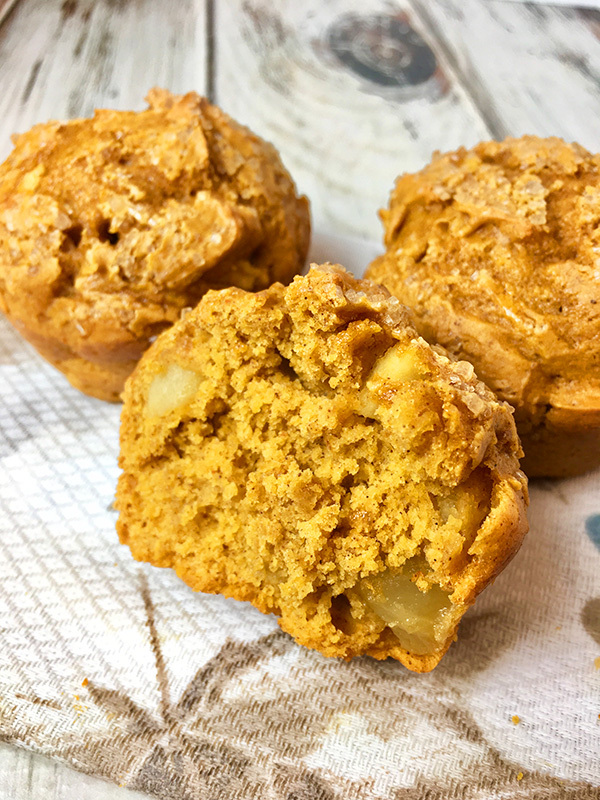 This incredibly easy recipe for Pumpkin Spice Apple Muffins uses only 5 ingredients and is an absolute treat to make. The smell while baking is unbelievable and the taste is even more unbelievable. Make these muffins for the family, for get togethers, to bring to parties or events and everyone is going to gush compliments your way. Yep, they’re that good! For this pumpkin spice apple muffin recipe, we’ll start by taking a shortcut – a box of yellow cake mix. So why yellow cake mix? It’s simply the best base mix without going trough the hassle of measuring out many more messy ingredients. The mix is the perfect base for many baked goods and it’s as easy as opening the box and dumping the mix in a bowl. We don’t even add the other ingredients on the back of the box. That’s right – no eggs, no oil, no butter. Just the cake mix and then we get going with customizing it. You’ve no doubt seen pumpkin spice everything during the fall season and and that’s because it’s really good! While the ingredients and ratios of pumpkin spice mix can vary slightly, it is most commonly cinnamon, nutmeg, allspice, ginger and cloves. You may see it labeled as pumpkin pie spice but you will see all those ingredients listed on the package. Again, we make this recipe simple by using a pumpkin spice mix instead of having to have all the ingredients on had and measured out. The reason we don’t have to add eggs or oil or butter to the cake mix is because we will be using a can of pureed pumpkin. Once again, we make this recipe as simple as possible to make. No need to roast a pumpkin and go through that whole process. After we’ve mixed the pumpkin and cake mix, it’s time for some fresh apples. Yeah, we’re going fresh here, especially since it’s apple season! All you need is two medium sized apples. If they’re smaller, use 3. Peel and dice the apples into small pieces. If you want to add a little extra, go ahead. The actually measurement is about 1 cup of diced apples. You can go another 1/2 cup no problem. Finally, to top off these easy pumpkin spice apple muffins, we’ll use turbinado sugar. I encourage you to not skip this ingredient. Turbinado sugar is a course sugar commonly used in baking and gives a sweet crunch and texture to the top of the muffins that is just like you’d get in a bakery. I’m telling you right now that this will be one of the best smelling recipes you’ve ever baked. 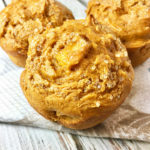 There’s not a candle on the market that can compare to fresh pumpkin spice apple muffins baking in the oven. If you’re having guests over – as soon as they come through the door they will delight with excitement over the sweet olfactory hues of these muffins. In a large bowl, add cake mix and mix in pumpkin spice. Then add canned pumpkin and stir with a wooden spoon for about a minute until it’s a nice smooth consistency. Then stir in the apples. Grease a 12-muffin tin and fill each cup about 3/4 full with the batter. Bake for 30 minutes. Check for doneness with a toothpick. If it comes out clean, the muffins are done!